What you don’t think construction paper crafts and Bible verses are going to impress your kids? Well, that’s not exactly what I meant when I chose this name. Maybe a little tongue-in-cheek. 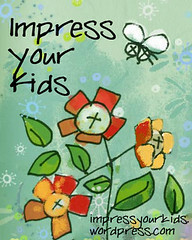 God’s Word and His laws are to be impressed upon our children. Have you ever done playdough before? My favorite thing to do is use cookie cutters to cut shapes out. You roll the dough, flatten it out and then press that cutter right into it. My daughter has cookie cutters in the shape of animals, food and people. My favorites are the food shapes. When I press that banana cutter into her playdough, a perfect banana shape comes out. And don’t worry, we’ll pretend to eat it just like it was a real banana. This is all we’re doing for our kids. They are impressionable and malleable. I’m going to use whatever methods I can to impress God’s Words–His laws and His love into her heart and life. And right now, the best way I know to do this is through scripture. God’s Word is living and active. It is a seed that will grow and produce fruit in her life. I don’t want to wait until she’s old enough to read the Bible herself. I have a hard enough time doing that! I want God’s Word to just BE a part of our lives. And that’s the purpose of this blog. To share how I am trying to impress my kids with God’s Word.